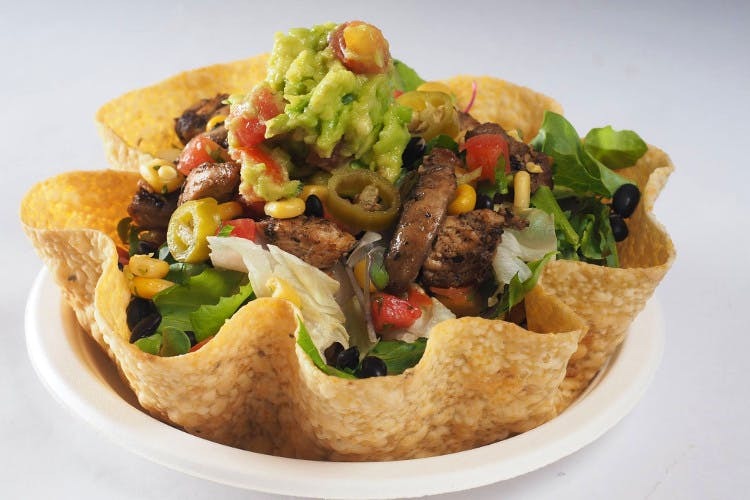 Indiblaze is a casual restaurant in Hi-tech city and it offers healthy Mexican options, juices, salads. We love their biryani, and it's priced at INR 130 only. Indiblaze is super-pleasant with bright walls, and vibrant posters. This place is huge and they offer quick service, so you can go here with your entire squad and inculcate healthy eating habits as they offer healthy meal options too. You can either make your own meal (Hearty Bowl/Edi Bowl) at their interactive counters or order from the variety on their menu. They have tikka bowls, pizzas, wraps, tenders, chicken wings, desserts, and beverages too. But what we love the most here is their biryani. Delicious as it can get, and presented beautifully too – the three biryani options here — chicken, mutton, mushroom, egg, and paneer are available at INR 130. We know you can’t keep calm, Hyderabad! The chicken biryani is boneless and delectable, and the vegetarian biryani has such tasty chunks of paneer or mushroom that will make your mouth water. The flavourful biryani is served with equally appetizing raita. Did we mention that it is also really filling? One person can finish an entire bowl. We’re definitely going for more sometime soon. They also have outlets in Jubilee Hills, Gachibowli, and more areas. So find the one closest to you. If the Summer blues are on, and you don’t feel like getting out, just order this Biryani from Swiggy and enjoy! Don’t forget to thank us later, however.